Lookin' like a young Julian Casablancas, these days KC. Vocals have a Dylanesque quality to them. I think that you need more swag coming out of the left hand. Very cool lyrics and I love the 1950's style quality of the track all-in-all. Is this an original? Unfortunately no. It's a song by a great artist named Pokey LaFarge. I'll be posting some originals in a bit. Actually saw him in concert last week. its as as easy as fishin, to be a musician, oh you can make sounds that are mellow. Very rocking, man :] Sounds like so,something from the Olde Country! Are you playing banjo too? It has an interesting history. Did it come to Brazil from Africa, or through North America to Brazil? Shoham , really glad that you enjoy this piece . I believe that the Banjo arrived here from both ways but what came with it from America prevailed for what is Country and Rural Music scene in Brazil . For Samba and Pagode a 4 strings is the deal . Banjo is a wonderful instrument full of joy and American music pulses deeply into my heart . Thanks for the info my friend . 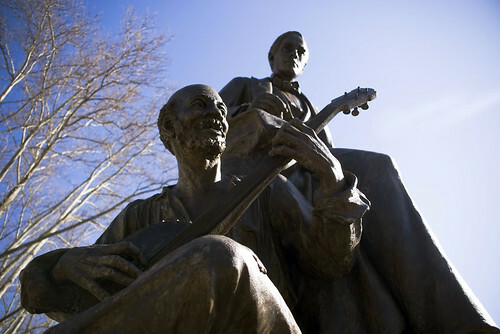 Here Stephen Foster is depicted as taking notes as a slave plays with a Banjo on his knee. Thoughts??? It is a complicated history! very cool! I do love the banjo! thanks so much and I do love your comment my friend ! Wow, this sounds great. You should post a video of your playing on here. It sounds like it would be really difficult to play that fast. Thanks so much for your feedback , Gabrielle ! If you find someone more shy than me to appear in a video tell me but I promisse that I'll post one ahead , my friend . A real wild number, sounds something like Django Reinhardt, too. I wish you could be in Pittsburgh next Saturday -- we will have a Stephen Foster music festival! Have you heard of him? Shoham : As usual , I really appreciate your feedback . Glad that you enjoy this tune also . Your support means a lot . I would love to be with you in Pittsburgh to the Stephen Foster music festival ( I will read about him in Wikipedia now ) . Thank you very much my friend ! Cool. Yes, you will like his music, I think. He is from here, but his music had an influence all over the world! He helped bring blues to the world -- by working with slaves and learning their music!